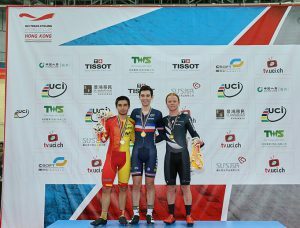 Co-organized by the Union Cycliste Internationale (UCI) and The Cycling Association of Hong Kong, China Limited (CAHK), the UCI Track Cycling World Cup -Hong Kong kicked off in the Hong Kong Velodrom. As the largest track cycling competition ever staged in Hong Kong, this event is recognized as a “M” mark event by Major Sports Events Committee. Local rider YANG Qianyu snatched the first medal for Hong Kong, claiming the bronze in the C1 Women’s Scratch Race. Honourable officiating guests at the opening ceremony included: Ms. Michelle Li Mei-sheung, JP, Director of Leisure and Cultural Services, Mr Wilfred Ng, SBS JP, President of the Organizing Committee of The UCI Track cycling World Cup – Hong Kong, The Hon MA Fung-kwok, SBS, JP, Legislative Councilor and Mr. Ronnie Wong, JP, Hon Secretary General of the Sports Federation and Olympic Committee of Hong Kong, China. Men’s and Women’s Scratch Race and Points Race concluded today. THOMAS Benjamin from France pocketed two gold medals in both Men’s Scratch Race and Men’s Points Race. 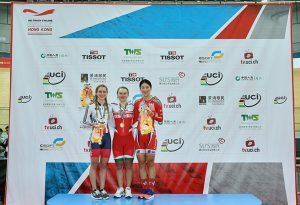 The Women’s Scratch Race medals went to SHMAYANKOVA Marina (BLR), TROTT Laura (GB) and YANG Qianyu (HKG) respectively, while D’HOORE Jolien (BEL) stepped on the top of the podium in the Women’s Points Race. In the qualifying races, Australia posted a time of 4:00.947 and secured a spot in tomorrow’s (16 January) Men’s Team Pursuit final. As for Women’s Team pursuit, Great Britain rode 4:19.369 to secure the top qualifying spot. In Men’s Team Sprint, Great Britain set the fastest time to move through to the gold medal race against Poland, while Rusvelo team will face Great Britain for the Women’s Team Sprint gold medal. Tomorrow’s race schedule, including exciting Finals of Men’s and Women’s Team Pursuit, Men’s and Women’s Team Sprint, Men’s Keirin and Women’s Sprint, will start from 9am. All eyes are on Hong Kong Olympic medalist Sarah Lee Wai-sze, who will contend in the Women’s Sprint under the cheering of the local fans. 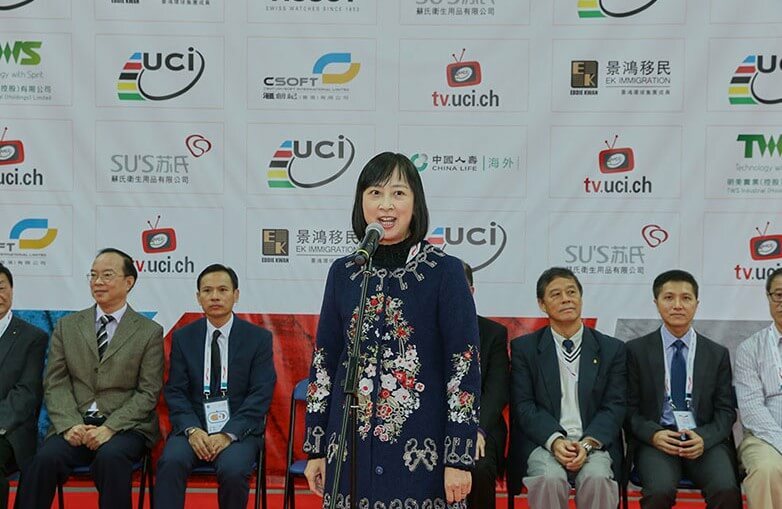 Ms. Michelle Li Mei-sheung, JP, Director of Leisure and Cultural Services, delivers a speech at the opening ceremony of the UCI Track Cycling World Cup-Hong Kong. 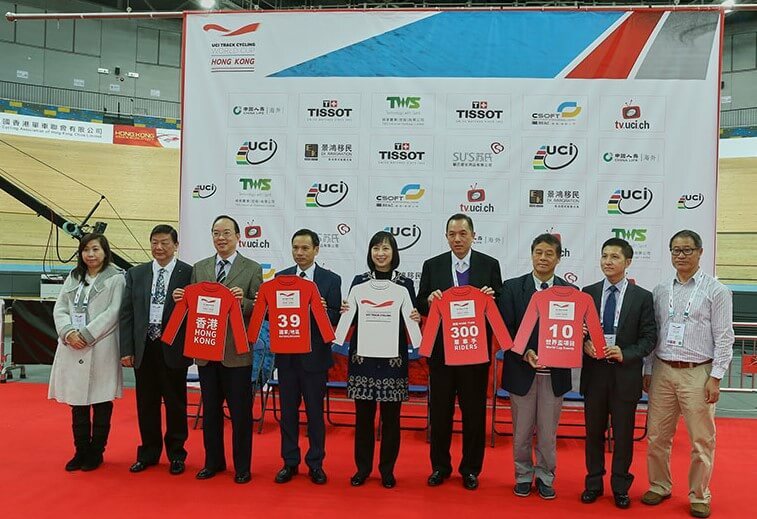 Mr Wilfred Ng, SBS JP, President of the Organizing Committee of The UCI Track cycling World Cup – Hong Kong, encourages the public to cheer for the Hong Kong Team. Officiating guests of the UCI Track Cycling World Cup-Hong Kong opening ceremony. The Women’s Scratch Race medals go to SHMAYANKOVA Marina (BLR), TROTT Laura (GB) and YANG Qianyu (HKG) respectively. French rider THOMAS Benjamin pockets two gold medals in both Men’s Scratch Race and Men’s Points Race. D’HOORE Jolien (BEL) stepped on the top of the podium in the Women’s Points Race. Great Britain secures the top qualifying spot in Women’s Team Pursuit.